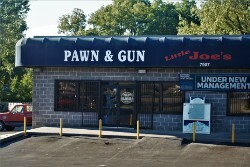 At Little Joe's Pawn West we strive to be your one stop pawn shop. Whether you need to pick up some tools for that do it yourself project at home, get some fast cash until pay day, or find some unique jewelry for that special someone in your life, we've got you covered. Not sure if we've got what you need? Stop on by at the address, or call the number below. You can also reach us on FaceBook to see some of the new inventory we have in! You never know when you might find something you might need or want so check us out often for special deals and unique items!